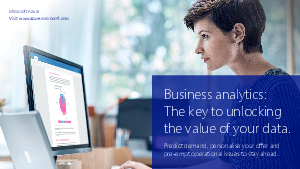 Offers > Microsoft > Business analytics: The key to unlocking the value of your data. From back office activities like invoicing to frontline services such as marketing, data is crucial to everyday operations. Yet it is what you do with this data that can differentiate your business.